This year my family are getting together on Christmas Eve. It’s going to be a team affair with my sister Sas providing the venue. My littlest sister, Nao looking after sweet treats. And me doing the savoury stuff. Over the years, I’ve developed a little Christmas Eve ham tradition. Not only because it’s absolutely delicious. But because it’s pretty quick as far as celebrational food goes. AND it doesn’t have any of the stress associated with trying to keep a turkey from drying out. So with the main event already in the bag, I started thinking about which sides to serve. It took all of about 5 seconds, once I remember I’d made a mental note to make my charred beet salad this Christmas. Of course, with an Irishman in our midst it goes without saying that there would be potatoes. Given that it’s (meant to be) Summer here in Oz. A potato salad seemed an obvious choice. For years my favourite potato salad involved roasting the spuds before tossing in a mustardy dressing. But I tend to have a restless and inquiring mind when it comes to these things so I broached the subject of the ‘ultimate potato salad’ with my Irishman. His response was that he’d need to taste a few different options to be able to tell for sure. I suspected an ulterior motive but agreed to go along. 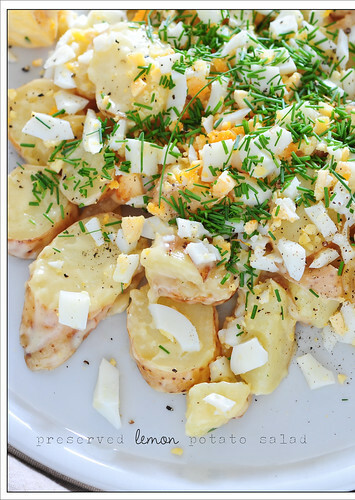 My Irishman wanted to include a simple salad of boiled potatoes (2 different varieties of course) dressed with extra virgin olive oil, parsley and a touch of lemon juice. Even though I’ve suffered through some absolutely terrible creamy potato salads in my time, I thought we needed one to represent the genre. I’m a little obsessed with preserved lemons at the moment so decided to add a some for freshness and zing. And some chopped hard boiled eggs to make it more substantial. As the reigning champion in my potato salad world, I just had to include a roast spud option. Tasting blind (with his eyes closed) my Irishman picked the preserved lemon salad as numero uno. Looking for delicious, Christmas recipes that won’t take forever? 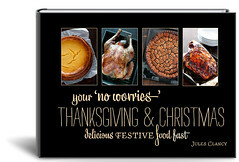 Then my eCookbook Your ‘No Worries’ Thanksgiving & Christmas could be just what you need. It may not have been the most photogenic salad, but it certainly was the winner in the taste department. If you’re using commercial mayonnaise, be prepared to add a tablespoon or so of lemon juice to freshen things up. 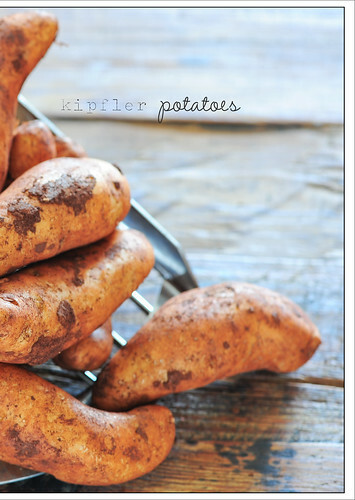 I love kipflers or pink fir apple potatoes for my salad. But new potatoes or fingerlings will be great too. 1. Scrub potatoes and place in a saucepan. Cover with water, add a little salt and bring to the boil. 2. Simmer for about 30 minutes or until tender. 3. Meanwhile, combine mayo and preserved lemon in a bowl. 4. When the spuds are cooked, drain and allow to cool a little so they don’t burn your fingers. 5. Slice spuds and toss into the mayo. Arrange on a platter and scatter over the chopped egg and chives. Season. main course salad – toss in a drained can of tuna in oil. vegan – use a vegan mayonnaise instead of the whole egg mayo and replace the boiled eggs with chopped avocado and a drizzle of lemon juice. Or if you prefer a more natural alternative to vegan mayo, make a dressing of 1 tablespoon lemon juice and 3 tablespoons extra virgin olive oil. 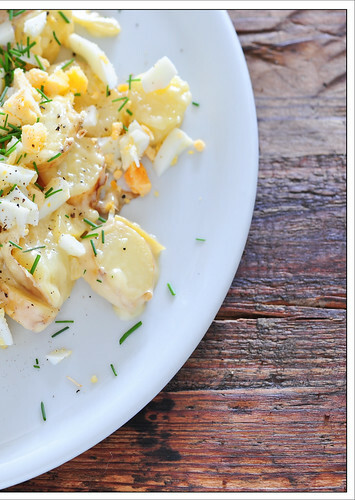 egg-free – replace the mayo with full fat natural yoghurt and a little olive oil for richness. And use a little creamy goats cheese instead of the chopped eggs. herby – feel free to replace the chives with fresh parsley leaves. lighter – toss in a few handfuls of baby spinach for a greener, lighter salad. no preserved lemons? – just substitute in the zest of a lemon and a splash of lemon juice. While using two different varieties of potato makes for more interesting flavour and texture, it isn’t the end of the world if you only use one variety. If this salad is going to be sitting for a while before serving, be prepared to moisten it with a little extra oil. The spuds like to soak it up. Again any salad potato is good here. Chats, new potatoes or fingerling. Leaving the skins on the potatoes makes life easier AND give more ‘potato’ flavour to the salad – super important if you’re cooking for an Irishman. 3. When the spuds are cooked, drain and allow to cool a little so they don’t burn your fingers. 4. 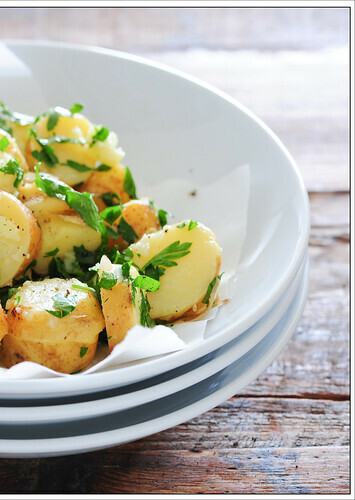 Slice spuds and toss in a bowl with the oil, lemon and parsley. Season generously. more spuds – feel free to play around with more or less varieties of potatoes. minted potatoes – replace the parsley with a very small handful of super finely sliced mint leaves (chiffonade). chilli – replace some or all of the olive oil with a good chilli oil. Or toss in a couple of finely sliced red chillies to keep things interesting. prosciutto – for a more substantial side, serve draped with some finely sliced proscuitto or salami. Even though this came third in our little potato salad contest, it’s still a really lovely potato salad so if you’re a fan of chorizo, give it a whirl. It’s better served warm to make the most of the texture of the roast spuds rather than serving at room temp. 1. Preheat oven to 220C (425F). Halve or quarter spuds and place in a roasting tray. Drizzle with a little olive oil and season. 2. Roast for 30 minutes. Turn and scatter the sliced chorizo over. 3. 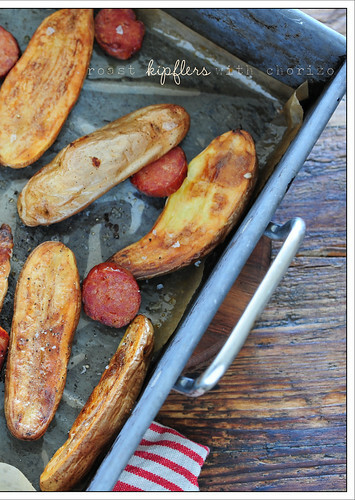 Roast for another 10-15 minutes or until potatoes are tender and the chorizo are browned. 4. Meanwhile, combine vinegar with mustard and 3 tablespoons extra virgin olive oil. Season. 5. 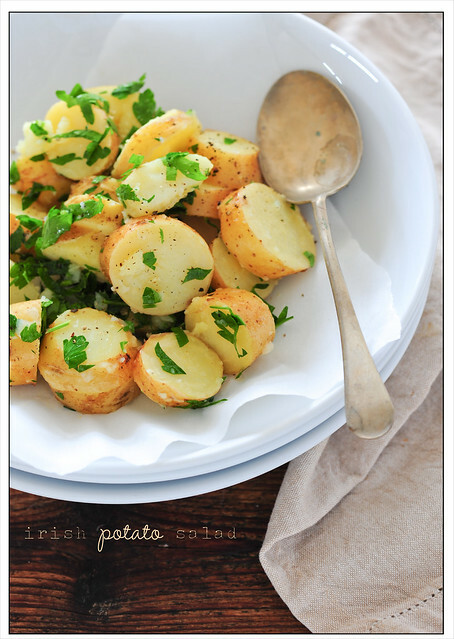 Toss cooked spuds into the dressing and serve sprinkled with parsley. vegetarian / vegan – replace the chorizo with a generous handful of halved cherry tomatoes. decadent – roast the spuds in duck fat instead of the oil. 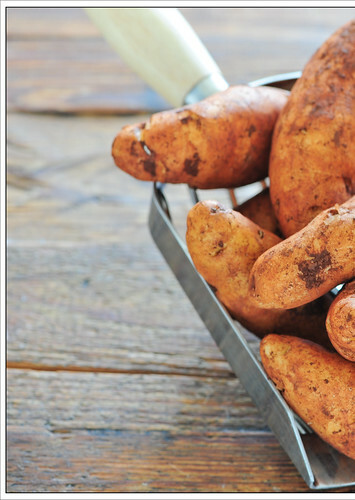 sweet potato – replace the potatoes with sweet potato scrubbed and chopped into bight sized chunks. Leave the skins on for extra flavour and nutrients. creamy – replace the dressing with some good quality mayonnaise. It’s time for holidays! THANK YOU for reading and supporting Stonesoup in 2011. Stonesoup will return on Monday 9th January. Hope you and yours have a really lovely and merry Christmas. And all the best for the new year ahead! I love the look of your roast potato with chorizo salad, it looks delicious. I think I will give that one a go. We have overseas visitors over the Christmas break, I am sure they will enjoy it. Have a great Christmas. Enjoying your delicious recipes from New Orleans, LA (USA)! Genius, no? I had never thought of doing a traditional potato salad recipe but instead using sweet potatoes. It was delicious! Best wishes for a Merry Christmas! 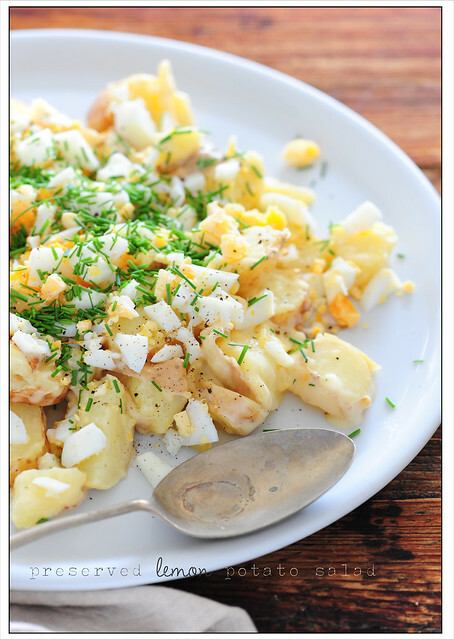 Since mayonnaise is my arch enemy, I always cringe whenever I see a mention of potato salad. Unlike the rest of the world, we here in the US can’t conceive of a potato salad where mayo isn’t the main ingredient. 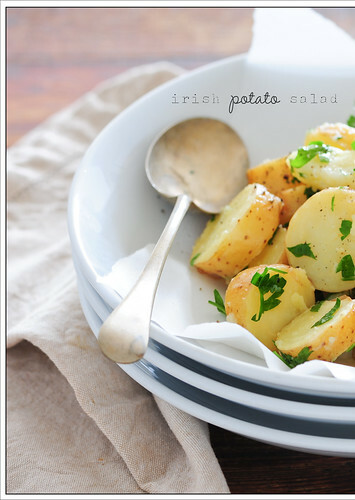 Your Irish Potato Salad and Roast Kipflers look fantastic. Very good selection of potato salads. Like Spanish i stay with the chorizo one! 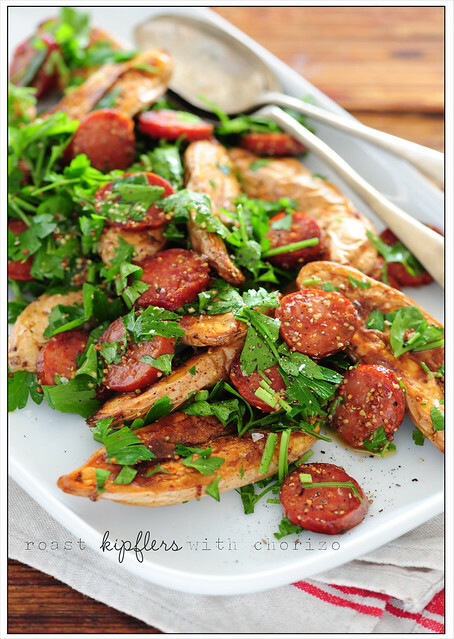 I’m loving the potato salad with chorizo Jules…mmmm! Thanks for three such fantastic options. 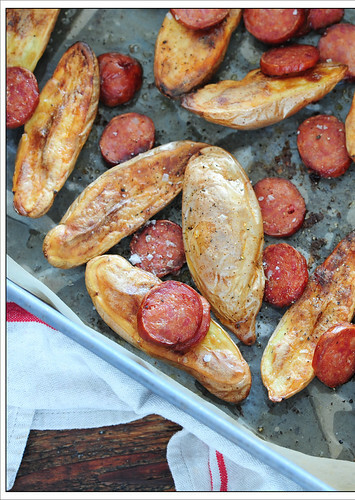 I’m popping the roasted potatoes and chorizo one down for this Saturday night. Have a wonderful Christmas! Thanks again for 15 minute lasagne!! love your detail..i was going to ask about replacing preserved lemon..then found that you already wrote that..potato is my all time favorite..i will try all of your recipe. thanks. Thank you so much for your inspiring recipes. These all look so delicious! We harvested a crop of kipflers from the kitchen garden yesterday… will give your recipes a try. Wow, I can’t believe he didn’t pick the one with sausage in it! Amazing! I add some chopped pickels sometimes to my potato salad. Great suggestions! I think I’m going to have a “potato” week. Made the chorizo salad, and am eating it as I type. Tastes absolutely amazing and I can’t believe it didn’t win!